If you have a concrete idea about manipulation of vectors you will be at an advantage in problem solving in many situations. Today we shall discuss a few multiple choice practice questions on vectors. 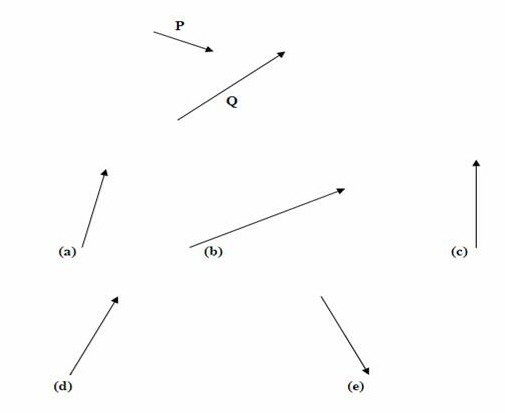 (1) In the following figure two vectors P and Q are shown. One of the vectors shown in options (a), (b), (c), (d) and (e) represents their resultant. Pick out the correct one. You can verify this from the following figure in which a parallelogram is constructed with the vectors P and Q as adjacent sides. The diagonal of the parallelogram indeed represents the resultant R of the vectors P and Q.
a = v2/r where ‘v’ is the speed and ‘r’ is the radius of the circular path. Therefore, r = v2/a = 22/4 = 1 m.
(3) A motor boat can cross a 60 m wide river in a minimum time of 10 s when the water is still. What will be the minimum time required by the boat to cross the river when the water in the river flows steadily at a speed of 1 ms–1? The minimum time required will be 10 s itself. In still water the boat will have to move in a direction at right angles to the bank in order to reach the other bank in minimum time. When the river is flowing, the boat will reach the opposite bank in the same minimum time if the engine drives the boat at right angles to the bank. In this case the velocity component of the boat at right angles to the river bank will be unaffected by the flow of the river. But, because of the flow of the river the boat will be carried downstream through 10 m by the time it reaches the other bank. A . B = AB cosθ where A and B are the magnitudes of A and B respectively. F = e(v×B) where e is the charge on the proton, v is its velocity and B is the magnetic flux density. 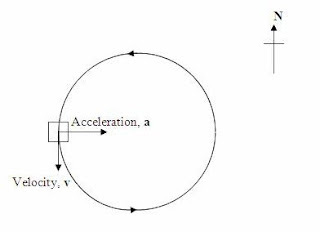 a = e(v×B)/m where m is the mass of the proton. This gives a = 3.84×108 (3i – 2j + k), as given in option (a). You will find a couple of multiple choice questions (with solution) on vectors here.